The business world is more competitive today than it has ever been in the past. As many people find themselves unemployed, more people are starting their own businesses, leading to more competition. The restaurant industry has been hit very hard by this recession – harder than most other industries. If you own a restaurant or any other business, you need to establish a strong web presence. Thankfully, ThemesKingdom makes that easy by providing high quality restaurant WordPress themes! ThemesKingdom, or Themes Kingdom as its often called, is a professional WordPress development firm. 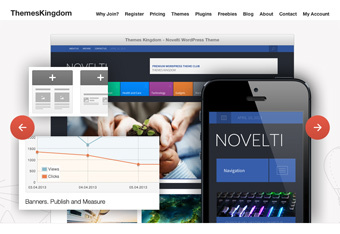 They have been creating beautiful, highly functional and sleek themes for business owners for years now. With more 47,000 satisfied customers, ThemesKingdom has established quite the track record for themselves. Themes Kingdom offers an excellent library of restaurant WordPress themes, which can help you get your restaurant website built in a matter of minutes. They also offer themes for a variety of other niches, as well as some generic themes that could be used for a lot of different applications. Despite having a huge library, the team over at ThemesKingdom is constantly updating their existing themes and adding new ones, keeping their content fresh and up-to-date. Generally their team adds about 2 themes to the library each month. That’s an average of 24 new themes each year! ThemesKingdom is all about customer satisfaction. They know that having help when you get stuck or have a question is important, so they provide stellar customer support. They offer themes documentation for all of their themes, as well as a comprehensive knowledge base where you can go to seek the answer to your questions. If these resources don’t answer your question, then you can contact the support team via email, support ticket, Facebook, or even Twitter!